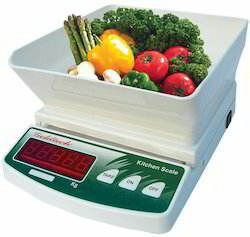 Kitchen Scale offered is backed by latest technology support so as to offer dependable support in multifunctional home usage environment requiring accurate measurements. Providing for high working accuracy, the system can display results in grams, pounds, kilogram as well as have high screen resolution which makes it easy of reading measurements. Some of its features include large LED display support, auto calibration, availability in standard capacities of 500 g, 600 g, 3 kg, 5 kg, 6 kg; ABS based platter, choice of operations through mains/battery support, outer body of ABS plastic for durable usage among others.